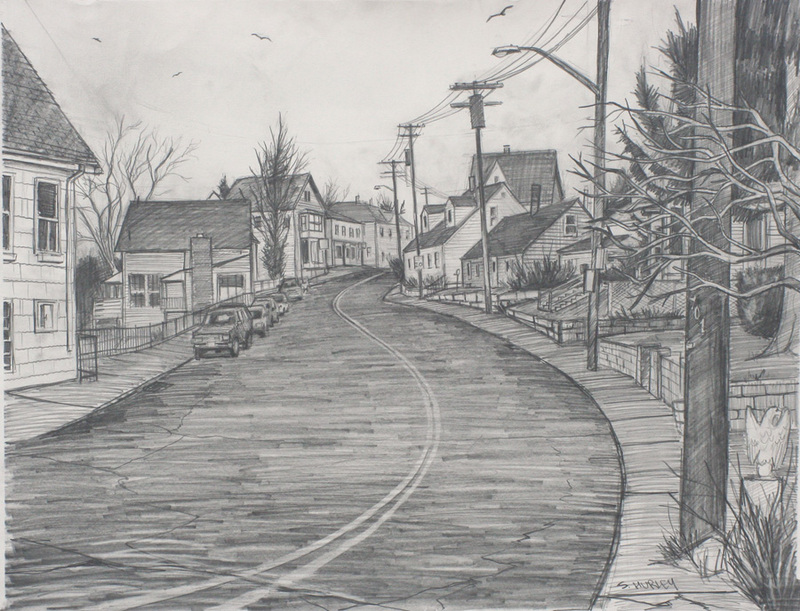 East Main Street - Pencil on paper- 2010 - 22 " x 30 "
Just outside my old apartment in East Gloucester, Massachusetts, this late-fall view was drawn mostly gloved and jacketed in bitter November and December winds. The row of cars includes my old Pathfinder, which I moved into position just for this purpose. My intention all along here was to use this drawing as the study for a snow-etching, but as drawing in the snow seemed unfeasible I instead hurried to get this done before the first flakes fell. The first afternoon that it actually did snow I rushed outside, took notes, and did a few quick sketches, which when combined with this drawing, led to my etching Evening Snow, pictured below.